Do you have a cause or event coming up? Do you want to let people know about it? Are you raising money for a charity? Or maybe you need party favors or a chance to advertise your business. Consider creating wristbands to fulfill your needs, and, even better, think about choosing neon colors to really set your creations apart and generate talk value. Use the online builder at AmazingWristbands.com to create your customized neon wristbands online! Pick your color, input your message, and add artwork to build your unique band. What are you doing for Make a Difference Day this year? The beauty of this day is that you can do anything to take part in it. Help a neighbor with her groceries, volunteer at a food bank, take supplies to animal shelter, make a donation to your favorite charity – the ideas to make a difference are limitless. 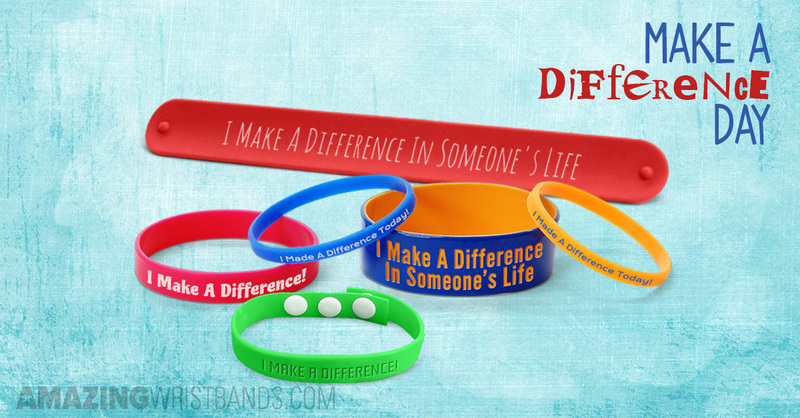 Make a Difference wristbands commemorate good deeds on Make a Difference Day and on any day of the year. How Custom Color Wristbands Are Useful? Color is a big part of a message. Custom color wristbands have many uses. For parties, it can tie to an overall theme. For awareness campaigns, it can signify a specific cause. For marketing and promotion, it can enhance brand recognition. Schools and teams can create custom color rubber bracelets that match their colors. At AmazingWristbands.com, you can choose from our large selection of colors, or we can match any custom color you need.